Basketball Court and the Classroom are no match for Marcus Ruh. 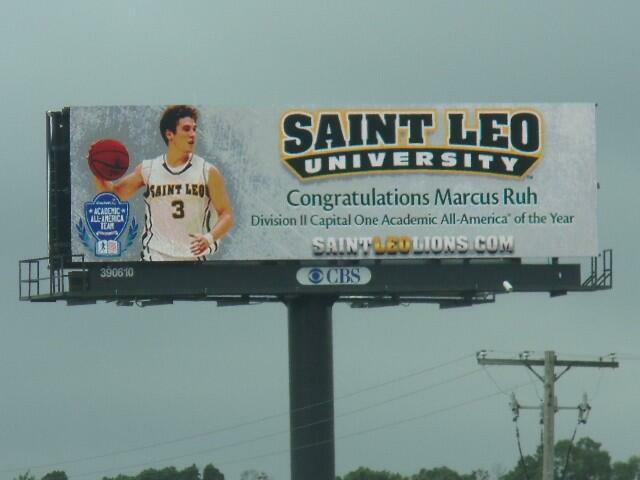 When student-athlete comes into conversation, the best of both worlds are shown from Saint Leo basketball guard, Marcus Ruh. The most highly touted player to come out of Leo in a longtime. 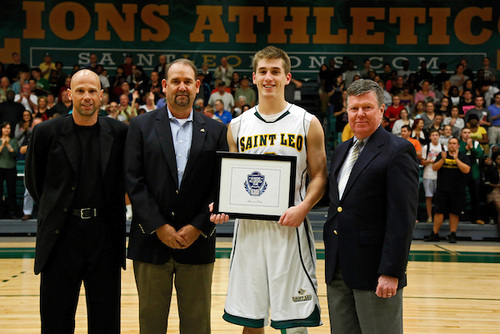 Saint Leo men’s basketball made its second straight NCAA appearance and won its first conference championship in program history. Marcus contributed 17 ppg (points per game) in his senior season. Question -Transferred in as a junior, and made an immediate impact for this program leading them to back-to-back tourney runs. What do you think was the reason for success? Ruh – I think the main reason for our success is because we had the right kids, the right coaches, and the right mindset coming in. We developed a team bond that made us more like a family than a team. We were all new kids and all going through the same things. I think that when you feel like someone is more than just a teammate, you will work harder with them. Obviously every team has a lot of talent, but team chemistry and coaching is what gets the most out of that talent. Our coaches and team chemistry was phenomenal. Question – Recipient of the highest academic honor a men’s basketball player can achieve being named the 2013 Capital One CoSida Academic All-America of the Year. How did you balance school work with practice, film, and games almost everyday? Ruh – The balancing of school, practice, film, and games everyday was something that a lot of us have been doing for years. I’ve always been a busy person, I played 3 sports in high school so I think it just kinda carried over from there. It just comes down to time management and priorities. I think a lot of people make it out to be very hard, but many athletes will probably tell you that being in a sport makes their time management much better. Question – The program is losing yourself, Tom Neary, Shaun Adams, and Trent Thomas. What are the coaching staff and returning players going to have to do to return this team back to the tournament in the coming years? Ruh – We had a great group of seniors, but I believe our underclassmen have a chance to continue to raise the program. Our coaching staff, Coach Randall, Blount, and Beamish are great coaches and know how to get the best out of their players. They also recruit very well. I think by just working hard and taking it a game at a time they will be back in the tournament next year. Question – Obviously you have mastered winning on the court and off the court your grades speak for themselves, so now graduating from Saint Leo what are your plans, wether it be getting into business, continuing your basketball career, etc.? Ruh – Im pursuing a number of different options at the moment. I would love to continue to play basketball professionally overseas if that is possible, but I am also looking to possibly work for a professional sports team on the business side of things. Right now, I think playing overseas is my first choice, but I’m just hoping I get the opportunity to do either one.